Revised February, 2015....at the request of buyers the images are now bigger and have captions. This product was designed for use by Speech Therapists or parents for articulation practice of the S sound. 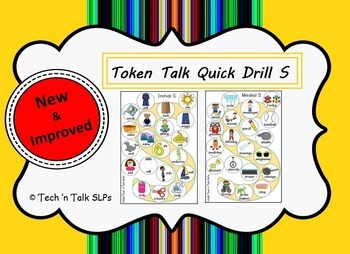 The packet includes six fun and engaging token boards for practicing the S sound. 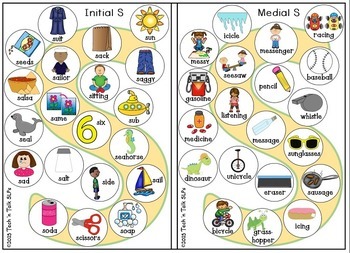 2 blank boards are included to use with your own S picture cards or word lists. 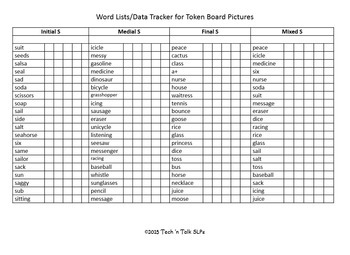 Also included is a page that provides the target word list for each board along with spaces for data collection/charting of responses. This can very easily be used as a pretest- and post-test probe for progress monitoring. This product was designed for use with penny sized tokens.